Using an innovative AI programming to help manage my savings and investments. I put in my extra money and let it work on making it grow more valuable. It uses formats like Facebook Messenger, where you can ask questions like balances, goals, status of subscriptions (Netflix, Spotify, etc. ), and even make changes according to your savings and investment plans. It will also be updating to communicate via text, Kik, Hangouts, and other chat methods. You will be able to set up alerts, reminders, status updates, scheduling different things like transfers, paying bills, etc. Signing up enters you for a chance to win an iWatch and a year of free investing services from WealRo! Sign Up Here to Enter the Contest and Sign Up for WealRo! 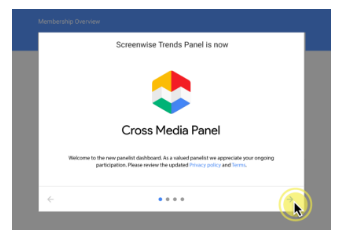 This is to inform you about the upcoming transition from Screenwise Trends Panel to the new Cross Media Panel. This transition should be seamless and any accrued rewards balance will be carried forward automatically. We hope to provide you with a simpler and richer overall experience within Cross Media Panel that ensures your continued satisfaction for participating in this online panel. You do not have to take any steps in order to support this transition. You will be notified by email within the next few weeks once the transition has taken place, along with additional details on how to access your account on the new panel website. Once you have received the transition email, you will be able to sign-in with your existing Screenwise Trends Panel account credentials to access your information, including your rewards balance. Shortly after the transition, the old Screenwise Trends Panel site will be shut down. The new Cross Media Panel panelist portal will allow you to quickly access all relevant information such as membership status and rewards balance from a single screen. The panelist portal will also be optimized to be viewable through your mobile device! We will also offer an expanded set of merchants from which you can choose to redeem your rewards. 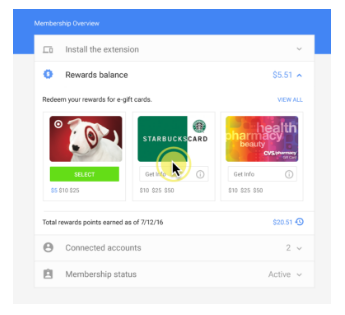 The simple to use redemption interface (shown below) will enable ordering of e-Gift cards within hours rather than weeks. Over the next few weeks, expect to hear more from us as we complete the transition from Screenwise Trends Panel to Cross Media Panel. Thank you for helping improve the products we build by participating in this program. I will post updates as they come about this transition and what it means. Gargoyle pays you to scan license plates wherever you are. Since license plates are public record, you can photograph them and upload them through the app and get paid for it! Sign up now and get in line to be a beta tester. You will get extra perks for it! Currently accepting beta tester applications. US Only right now, but other countries are on the list for potential opportunities.